28/8/12 - Acquisitions - London, National Gallery - We often pass on to our readers announcements concerning recent acquisitions by British museums through the system of Acceptance in Lieu and will soon provide a thorough update on works secured thanks to this fiscal method since 2010. These additions are published regularly in annual reports which nevertheless appear with at least a two year delay and do not always disclose the name of the establishments receiving the works since the decision occurs several years later at times. We had already published two acquisitions through acceptance in lieu which have now been definitively attributed to the National Gallery in London. 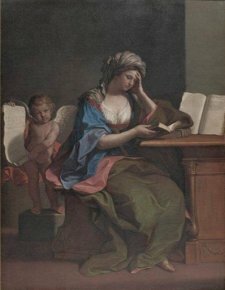 The first had been presented temporarily there (see news item of 9/3/12) ; this is Guercino’s Samian Sybil (ill. 1) which today fortunately joins the Cumaean Sybil by the same artist held by the museum. 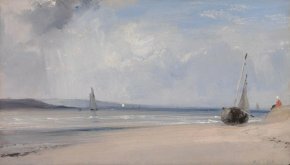 The second painting now permanently belonging to the National Gallery in London is by Richard Parks Bonington (ill. 2). Strangely enough, this is the first work by the artist to join the collections. We had published this small oil on panel as representing an Estuary in northern France and painted around 1824 (see news item of 17/8/07). The museum now identifies it as a view of the beach at La Ferté, a hamlet close to Saint-Valéry-sur-Somme in the Somme estuary and dates it precisely 1825. The stroke is particularly fluid and the atmospheric effects of the sky are remarkable completing a style close to that of two friends of the artist, Paul Huet and Eugène Delacroix but also recalling the Impressionist painters who were to appear decades later.